I was surprised to see that Pahrump had been developed to a larger community of Commercial establishments and residences as compared when I first passed by at this place 10 years ago. 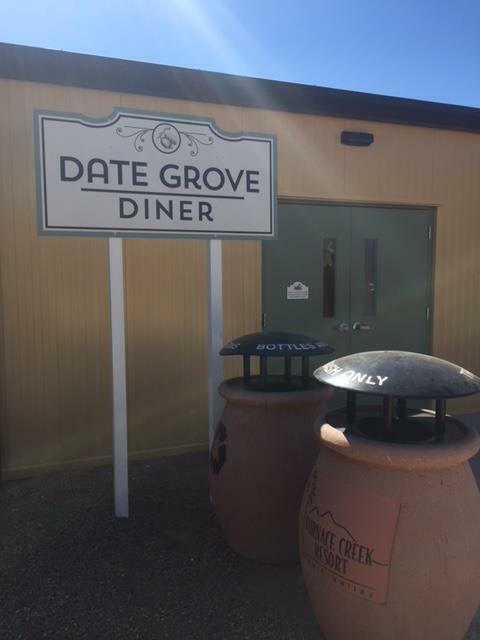 This town is 60 miles away from Furnace Creek and it is about 50-minute to 1-hour drive. The scenery of the desert and mountains changed as we entered nearer to the Death Valley Park. 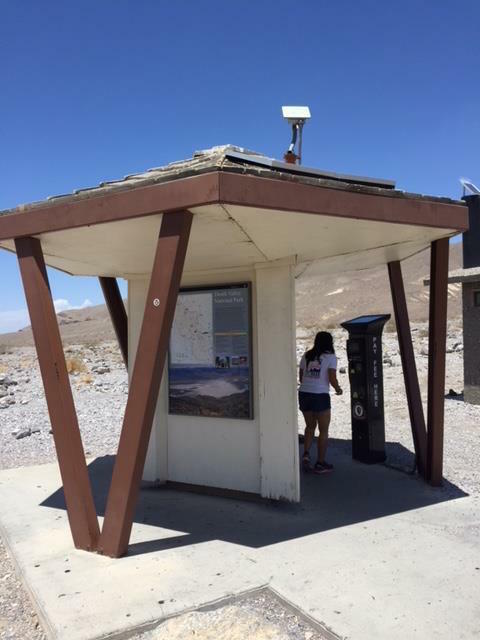 Since it is mandatory for the Badwater 135 runners to purchase a Permit or Adventure Pass to stay at Death Valley Park, we have to stop in an unmanned Kiosk along the Highway and purchase the $30 Permit Pass which Tess Leono had to show to the BW staff during her Registration at Furnace Creek Registration Area. Since the place is unmanned Kiosk, you need to have a Credit/Debit Card to purchase the said Permit Pass. From this point, you could see all around you the different colors of the rocks and mountains which I was not able to appreciate during my previous trips in this area. Five miles from Furnace Creek, on your left, you could see a large Parking Area which is the trailhead of the famous Zabriskie Point, a tourist spot in the area. However, at this period in the year with the high temperature in the area, it is very risky to hike on these spots. It was later in the day when I found out that these mountain and rocks around us were popular shooting locations of Hollywood’s Cowboy Films when I was still a child, starring Richard Widmark, William Holden and Marlon Brando in their younger days. 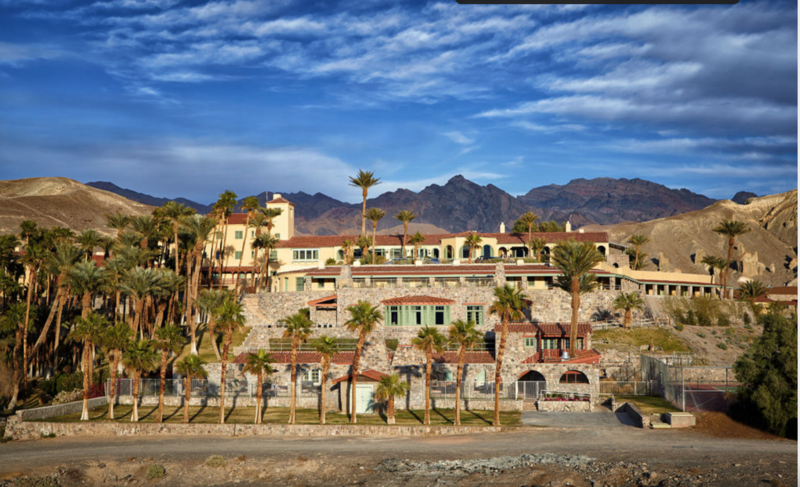 Finally, we reached the Furnace Creek Inn Resort which is the only Hotel establishment that you can see at the intersection of Highway 190 and the Road to the Badwater Basin. It is located on the right of the Highway. 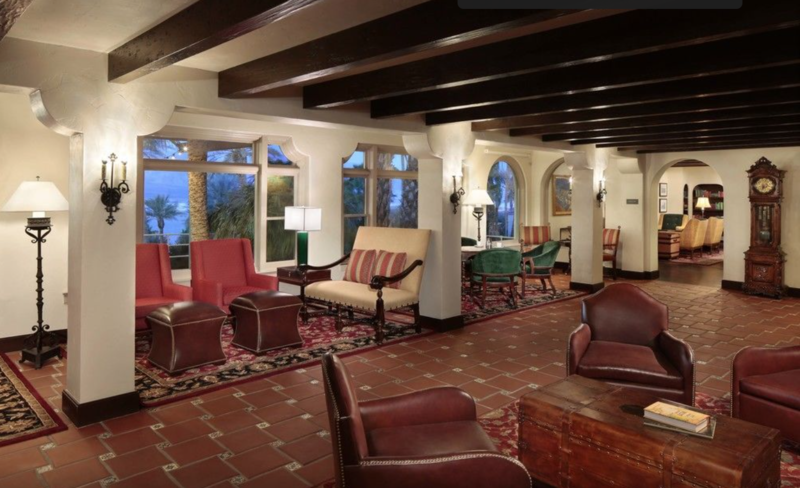 The place is now called the Oasis At Death Valley which has a Resort, Ranch and Golf Course! This is the first place where runners should go for their Registration, Body Shots/Picture with Race Bib, Group Picture of the Runner’s Team, Expo For Merchandise Items for Sale , and where to meet the other Runners for the first time. There was a long line of Runners and their Support Crew when we entered to the Lobby of the Resort. There was a need to Fill-Up some forms for the whole Team and wait in line before we were told to proceed at the Registration Area, which is the Ground Floor of the Resort. The Registration and Plate Number of our Support Vehicle were also needed. After Tess submitted all the required forms and documents, we were led to the Pictorial Area where Tess “Mugshot” was taken as well as the Group Picture of Team Leono. 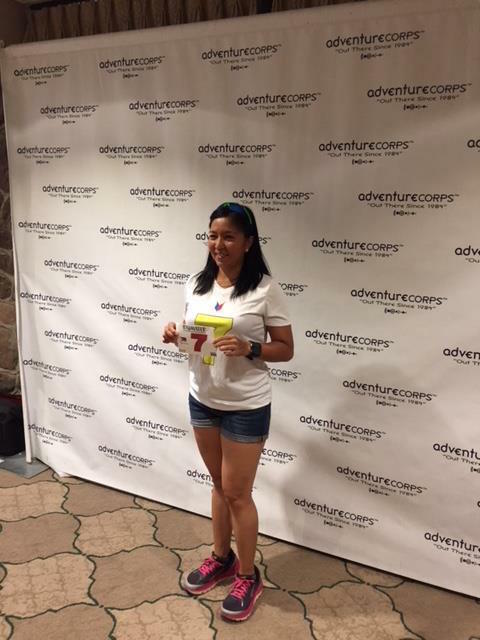 The next step is more interesting…Shopping for the Badwater Merchandise! 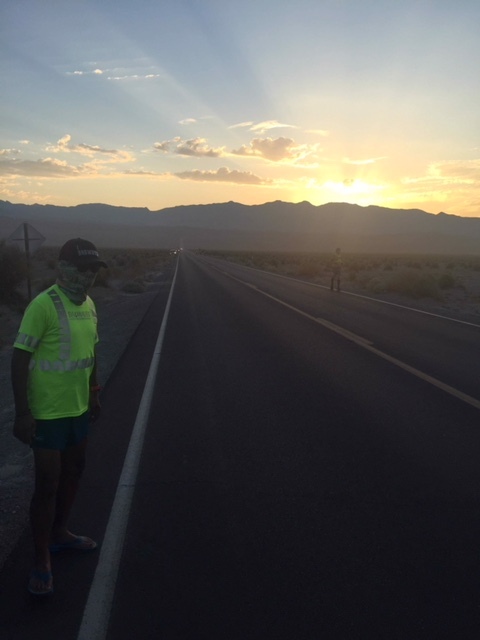 Badwater Rules and Regulations is very strict that we need to have Category 3 Reflectorized Outfit for the Support Crew. As compared to Category 2 Vest, the Category 3 Vest has Reflectorized bands on the sleeves. It is only the Runner/Participant who have the option to use any kind of reflectorized vest during the race. I had a chance to greet my friend, Catra Corbett, who was at the Pictorial Area promoting her newly published book and I was able to buy a copy of her book with an autograph. One of our Support Crew was able to buy also her book and had some pictorial with her. From here it was time for us to look for our accommodation which was reserved by Tess. One mile from the Oasis At Death Valley along Highway 190, is where our room/accommodation is located. 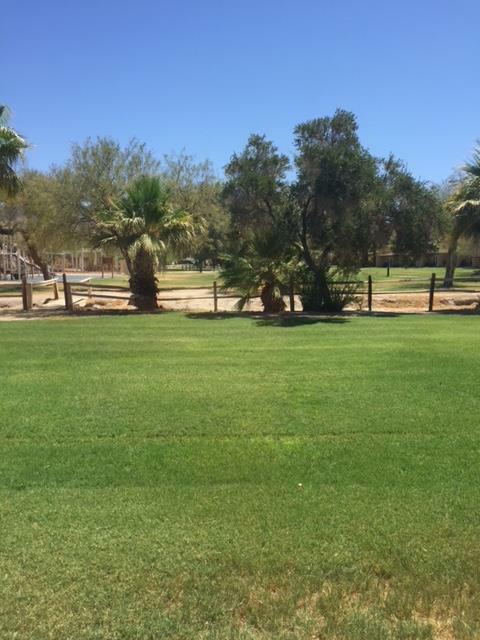 It is called the Furnace Creek Ranch, simply called “The Ranch”! The entry road to the establishment is beside a Gasoline Station (the only one at Furnace Creek!) and a road further down along the Highway is the entry to the Furnace Creek Visitor Center where the Digital Thermometer is located. After our Check-In at The Ranch, we finally have the comfort of our bed in an Air Conditioned room. The room is a heaven for us knowing that the outside temperature was 120 degrees Fahrenheit and it was still going up later in the afternoon. The Ranch consists of rows of two-store buildings with rooms and we were designated to stay at Building 6, first floor. The rooms are designated from 500-900, of which I really don’t know if the establishment has that 400+ rooms in the said place. 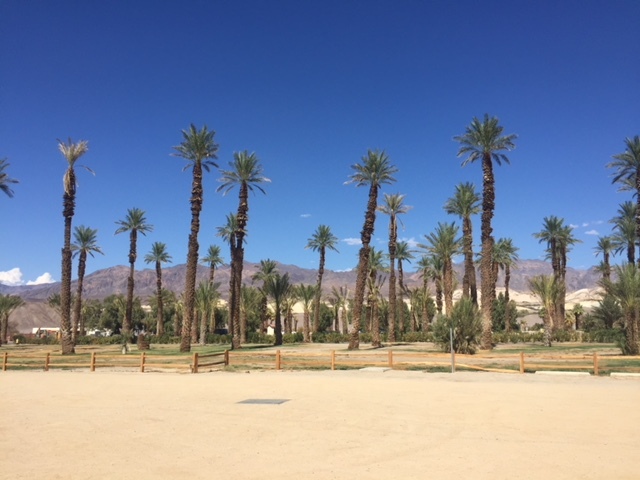 From afar, you could not see the buildings as this patch or portion of the Furnace Creek is the only green and vegetated area in the place surrounded with trees and palms. There is a Diner, a Golf Course, and Golf Shop/General Store where we can buy some groceries and ice, but with a higher price for obvious reasons. After we settled in our room with our personal belongings, we went to the Diner to have our late Lunch/early Dinner. It is a walking distance from our Building but we opted to ride in our Support Vehicle because of the heat outside the building. The Diner is big and according to Tess, it is a new structure in the place. It looks like a huge Cafeteria to me where one has to order his/her choice of food whether its Pizza, Pasta or Hamburger and some packed foods and sliced fruits. There is unlimited serving on drinks/Soda if you paid for the drinks. A Whole Pizza costs $24.00, enough to have 2 slices for the members of the team and Hamburger with French Fries at $13.00 each. The drinks must an additional $3.00 each! 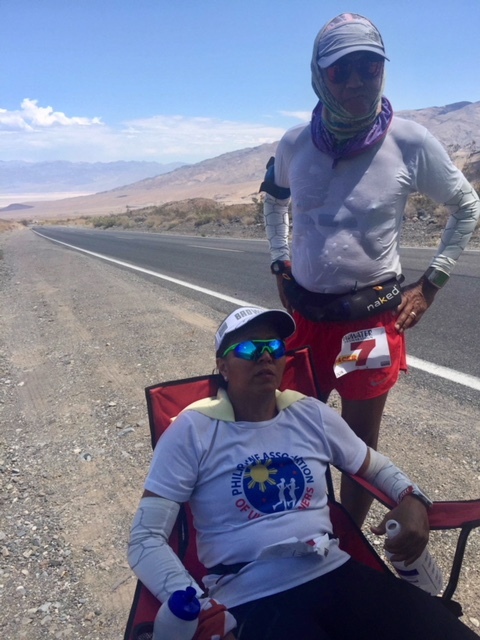 After our lunch, we went back to our room and waited for the scheduled Race Briefing at 5:00 PM of Sunday with only the Runner and the Chief Support Crew in attendance at the Furnace Creek Visitor Center. The whole team went to the Furnace Creek Visitor Center where there is a Hall and Seats, which looks like a Stage or a Hall where a Movie/Film could be shown. 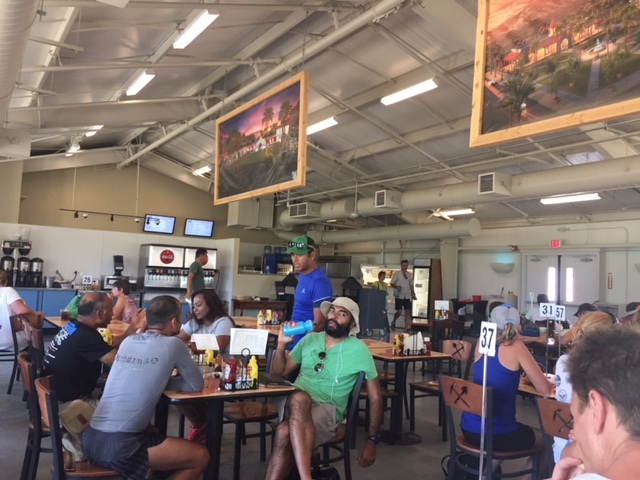 The rest of the team waited at the Lobby of the Visitor Center where there is a Merchandise Store, Museum, and Reception Area manned by The Park’s Rangers/Management. Tess and I went inside the Hall and the Race Briefing had started already. All the seats were full, some were seated on the floor at the back portion of the Hall and some were just standing on edges of the said Hall. Chris Kostman, the Race Director & Organizer was at the stage infront of a Speaker’s Podium and Microphone. He just barely started as he was relating to the audience about the history of the event and the his story on how he became the Race Director and Organizer. His briefing progressed with a relax tone with some funny ad-libs to his briefing. 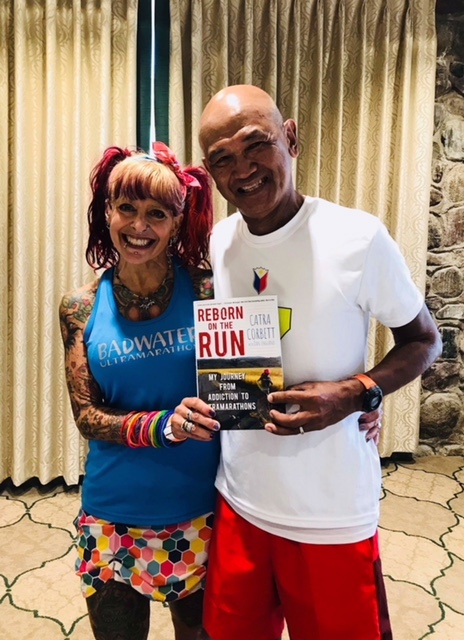 He explained the reasons why the Badwater 135-Mile Ultramarathon Race is considered as the “Toughest World’s Foot Race” as stated by the National Geographic Magazine; writers from Outdoor Magazines around the world, and from other Runners who finished this Race. As he was talking about his mission/objective as the Race Director, he asked the audience if there are Race Directors in the audience and asked them to stand up. Of course, I was one of those who stand up because my BDM 102 is becoming popular to international runners. Until it came to a point when he called the International Runners mentioning their country and letting each runner stand up to be recognized. I cheered, shouted and clapped when Tess Leono and Philippines were mentioned by the RD. He asked the “First-Time” runners to stand up and congratulated them for being selected in this year’s edition of the event. And then asked the “repeaters” of this event to stand up, mentioning how many times they have finished and then asked to sit down until the last one, Marshall Ulrich, remained standing! 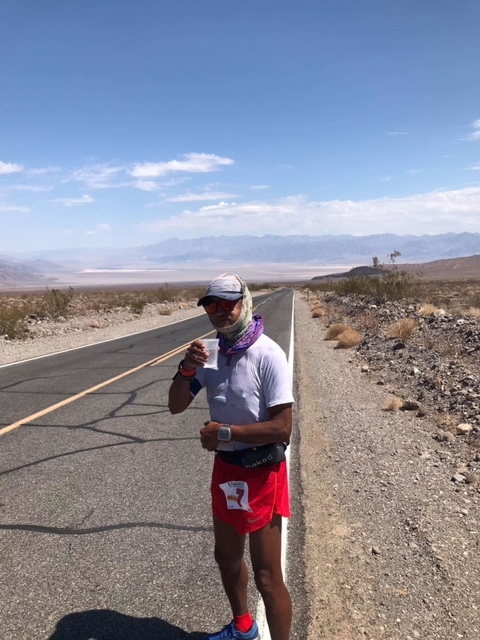 Yes, he is the Legend of the Badwater 135 for finishing the event for 20 times and winning as Champion in some of the editions, I think, for four or five times! 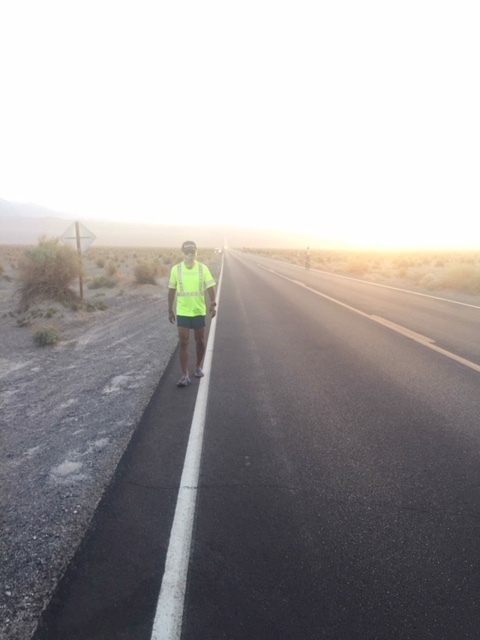 He awarded an Award of Recognition to Ray Sanchez who finished the Badwater 135 for 10 consecutive years! Wow! And after the awarding, Ray Sanches was made to say a few words to the audience. This guy is really tough! He got a lot of applause from the audience. The last part of the briefing is the briefing presentation on the Rules and Regulations of this race. It just a repetition of those R & R that you can read on the event’s website and the regular e-mail that a runner-participant receives from the Race Director. Some administrative announcements had been made about what establishments along route which will be open at nighttime and early morning where gasoline, water, grocery and additional ice will be available. 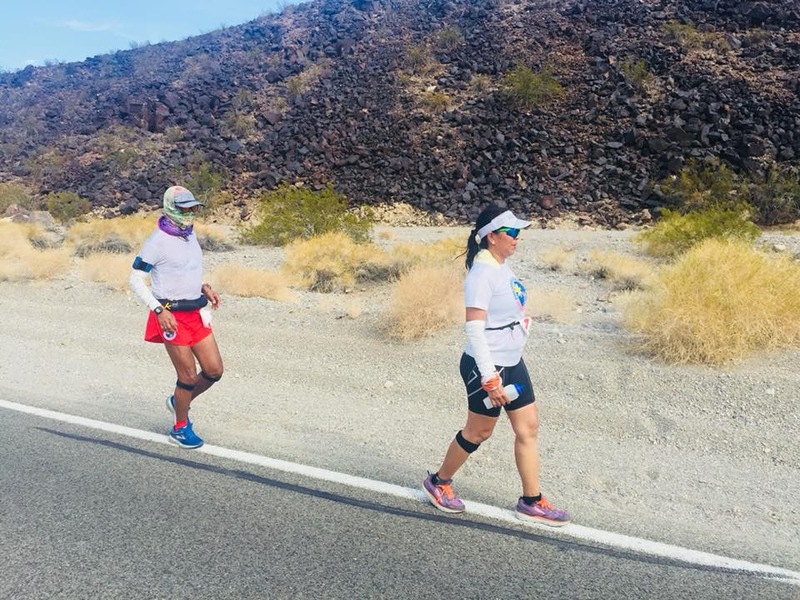 There are four significant places/locations where these runners’ needs will be available: Furnace Creek Ranch; Stovepipe Wells; Panamint Springs; and Lone Pine. 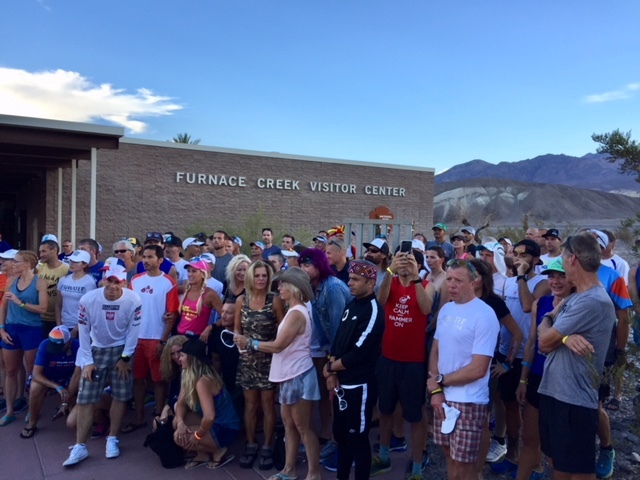 After the briefing, all the runner-participants were asked to assemble infront of the Digital Thermometer outside the Furnace Creek Visitor Center for the Group Picture. I took this opportunity to take some picture of the runners and talked to some of them. Tess Leono will be starting with the First Wave of Runners at 8:00 PM of Monday, July 23, 2018. 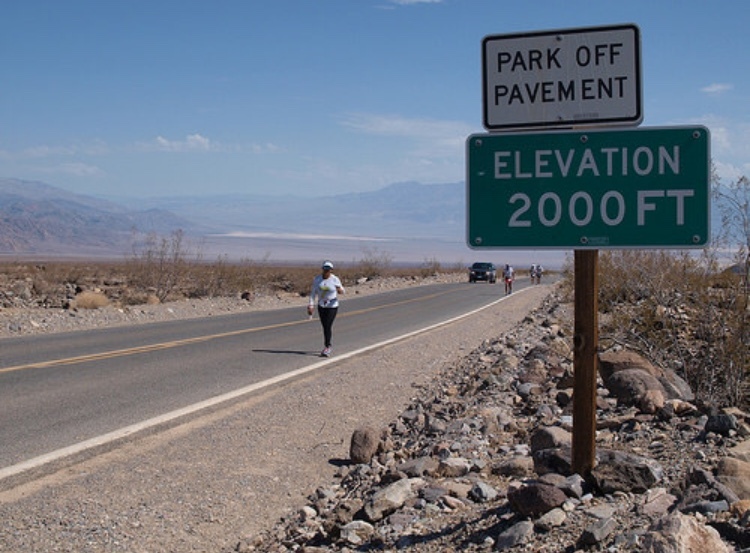 We have at least a day, 24 hours, to rest and prepare before going to the Starting Line at Badwater Basin, 17 miles away from Furnace Creek. We should be there before 7:30 PM for the Weighing, Final Briefing and Group Picture. It’s time to rest and sleep. It will be two (2) very long days ahead of us once the race starts.